So the Nets beat the Sixers in Philly last night, 109–89, and they've now kicked off the calendar year with four straight wins. More notable is that they've won six of their first seven games under (Fordham's own!) P.J. Carlesimo, who took over as interim head coach last month when Avery Johnson was fired. Deron Williams led the Nets with 22 points, and Reggie Evans grabbed a career-high 23 rebounds. Andray Blatche, by the way, scored 20 points, on the day he was interviewed by Philadelphia police as a witness to an alleged sexual assault. 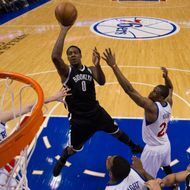 (Via the AP, the Philadelphia police commissioner said that preliminary findings of the investigations show that Blatche wasn't involved.) Next up for Brooklyn: a three-game homestand beginning Friday night against Phoenix.